An award-winning team of alumni from U of T’s Faculty of Applied Science and Engineering is building satellites so small they could fit in your gym bag. Their startup, Kepler Communications, plans to place 140 of these low-cost “cubesats” into space over the next five years. The first one will blast into orbit this November. U of T News spoke with Mitry and Jeff Osborne, co-founder and vice president, business development of Kepler, ahead of Entrepreneurship@UofT Week. 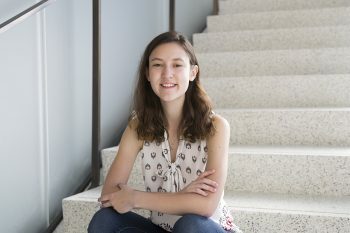 Mina Mitry: Kepler is on a mission to connect the people and devices that gather the world’s information. We’re deploying the largest constellation of small telecommunications satellites to connect devices on the ground, like oil pipeline monitors, and devices in space like satellites that take pictures of the Earth. Jeff Osborne: In order to reach this mission, what differentiates Kepler is the use of small, low-cost nano satellites. Each one of our nano satellites is around five kilograms in weight and no larger than a loaf of bread. As engineering students at U of T, when did you first come up with the idea? Mina Mitry: Jeff and I were both doing graduate studies at U of T. Prior to Jeff starting his PhD, he had been roommates with other people who were founding space companies and had recognized there was this underlying trend of growth in the space sector. So we started together, and then we brought on board two other co-founders, Mark [Michael] and Wen [Cheng Chong], two of the smartest people that I knew in my network who could really help us see this vision through. The four of us left all of our commitments. I turned down further studies and job offers. Jeff left his PhD. Mark left his PhD, and Wen left his full-time job. We’re now a team of 10 and hoping to be a team of 25 next year. Jeff Osborne: What was really the root of the company…was that we had all spent a number of years doing student design projects out of the university. We spent three years on the U of T aerospace team where we built small rockets, drones and small satellites together. That was really where we learned how to work together and build those strong bonds of cooperation that still exist and allow us to thrive. What gives your startup an advantage? Mina Mitry: Our core advantages are technology and regulatory nature. This is very difficult to explain in layman’s terms…you need certain frequencies in order to be able to operate. They’re allocated on a first come, first served basis. Doing them first gives us the priority to be able to use them. Later entrants will have to either abide by constraints that we set out for their systems . . . or they’ll have to lease, buy or do something to work with us. Another key advantage is the really small form factor radios and antennas that we’ve been able to build at a very very low cost. We’re at about one one-hundredth of the next comparable telecommunications satellite [in terms of the size and cost]. How are you going to get your satellites into space and when? Jeff Osborne: For the size of our satellite, in a launch, it is what’s called a secondary payload. Effectively, what you do is piggyback into orbit. When a big launch vehicle goes up – like the next generation Space X – it will have a primary payload on the launch vehicle. But for each launch going up, there’s always excess mass on the vehicle…there’s always extra space in the trunk to put additional satellites on board. Those are called secondary satellites. So, we buy up those secondary tickets for a fraction of the price, and we hitchhike to orbit! Our [first] launch is in November with Polar Satellite Launch Vehicle (PSLV). It’s an Indian rocket. How to actually deploy satellites into orbit is with a glorified jack-in-the-box. It’s basically just a box with a spring. They open the lid [of the launch vehicle’s cargo area] and satellites get thrown out [into orbit]. How many of your satellites are you putting up at that time? Mina Mitry: We’ll put up the first one at the end of this year and we’ll put up the next generation probably in mid-2018. They’ll provide the initial service to our customers. With only two satellites up in orbit, you can look at applications that have latency requirements of about 12 hours. If you can get the data back to them within 12 hours in an economical way while layering on other services then there’s value to be had there. From there, we want to scale to 20 to 40 spacecraft within the 2018-2019 timeframe, eventually building our way to about 140 [in our] satellite constellation. The satellites remain in orbit for upwards of 10 years. We’re putting up new satellites every three years so that we can put up better technology that will improve our network. Jeff Osborne: On every new batch of satellites we’re putting up, we can improve date rates and connect to more devices etc. It’s really about applying Moore’s Law to the space industry, which historically hasn’t happened. What are examples of some time-sensitive applications? Jeff Osborne: Let’s say you want to measure the strain on your bridge in a remote area. It doesn’t necessarily matter if you get the data back in milliseconds – the bridge probably isn’t going anywhere. Or, let’s say you want to measure the flow through your pipeline in the middle of Alaska to identify leaks. It doesn’t really matter how long it takes for the data to get back because you can’t get a crew out to fix the leak for another week. Conversely, there are other applications that are very dependent on latency. Let’s say you want to measure the heart rate of an emergency responder in a disaster situation. You need to know that information instantaneously so you can deploy response measures. What is the range of applications? Jeff Osborne: Fundamentally, what we are trying to build is the pipe to connect remote devices. It doesn’t really matter what you’re measuring, whether it be strain, heart rate, temperature, flow or GPS positions. We’re relatively agnostic about the type of data that is flowing through. We’re just providing the capabilities for customers to be able to connect their devices. 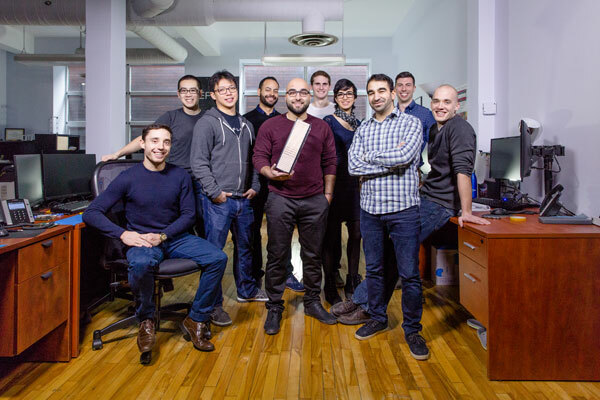 What kind of support did you receive at U of T to get Kepler started? Mina Mitry: U of T was very, very impactful in helping us get this startup off the ground. We started at Start@UTIAS, a program run by [alumnus] Francis Shen who generously donated a fair amount of money to the university to support and encourage entrepreneurship specifically within the aerospace community. That program helped us get started and seeded us with $25,000 of capital to help build our ideas. We then moved on to the University of Toronto Hatchery, another really impactful program that helped us understand how to tell our story, how to communicate with various stakeholders and how to focus our attention and time on things that really mattered for the company. 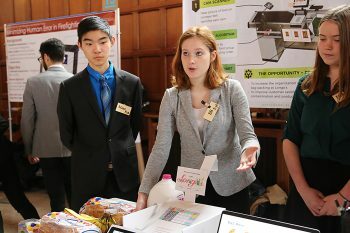 From there, we went to Creative Destruction Lab, which was another incredible U of T program. That was really the catalyst to expanding and growing our network. It helped us understand the players in the startup community outside of aerospace, how the funders work, how customers could work, and it helped us develop a more focused scope. All three of those helped us from ideation to fundraising and scaling the company. Jeff Osborne: When we started working on student design projects, that experience gave us was the confidence to think we could actually do something like this. When you’re staying up until 6 a.m. to test fire a rocket engine, or when you crash your plane three days before a competition, and you have to bring the entire team together to rebuild it, that not only shows you what can be done by the team, but it also gives you the confidence that when you have these big problems, these big challenges, you can actually address them. Is there an advantage to being located in Toronto for your startup? Mina Mitry: Being a Canadian company, there are a ton of advantages. There’s the [federal] Scientific Research and Experimental Development [tax incentive] program. For our company, which is a high technology venture, the government is willing to support our development by giving us 40 cents on the dollar [for research and development costs]. 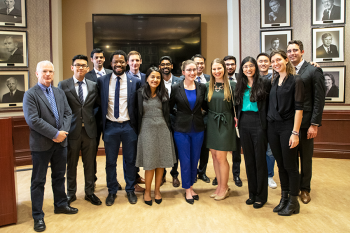 In Toronto, we also have a huge talent pool with resources coming in from the University of Toronto, the University of Waterloo – some of the top engineering schools [in the world] – feeding our talent pool. And now we have this huge catalyst in the United States [President Donald Trump], and a number of expats wanting to come back to Canada. Of the regions you’re going to choose within Canada, Toronto is a pretty key location. Jeff Osborne: In the last couple of days, the regulatory environment for space station operations in Canada is becoming much more favourable for small players. Without going into too many details, there are a few rules the Canadian government is implementing that will make it much easier for small companies to get access to frequency, to get space station licenses that don’t exist in other countries. In closing, what would be your advice to students right now at U of T who are in the infancy of their startup or just have a really great idea? Mina Mitry: I got the bug for startups running a university design team. I’d get involved in design projects. That’ll give you a flavour of what it’s like to run a company. Find a killer team. [Those student design projects] gave us the team we’re working with today, which we otherwise probably wouldn’t have found. Most of Kepler, as it exists today, is that team. We have technology, but it’s not nearly as valuable as the team that built it. Jeff Osborne: If someone has ideas, just do them. Do them! And figure out everything else along the way. There’s not many times in one’s life where you have the opportunity to potentially build something exciting with people that you know and work well with. It’s a no-brainer!